Have you been enjoying the inspirations from our Muse Donna Mikasa? I know I am. Ready for another? I did manage to veer away from the original a bit. I used most of Donna's elements...the angled card front, gold sequins, a graphic background & a die cut word and came up with something completely different...a masculine birthday card. It's not nearly as beautiful as Donna's, but I think it's going to make a perfect birthday card for my hubby next month. Love the visual of you creating across from your hubby! 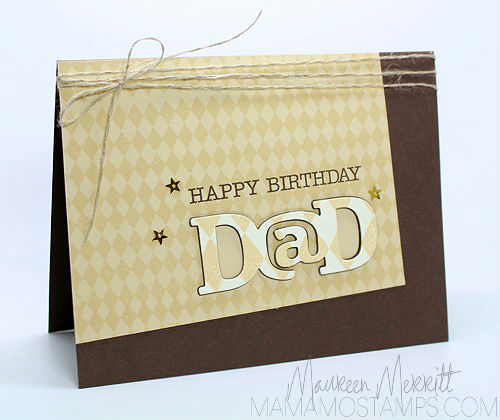 His card is awesome...love the subtle background and the fabulous die! really love your take on the inspiration! I LOVE this Mo! You did a great job creating a masculine card. Your card is lovely, the earthy colors look great! Thank you for choosing my card for HM from last week's CASology gallery. I'm thrilled! SUPER card Maureen! Love the story and I can just hear those giggles!! This is a great masculine card! 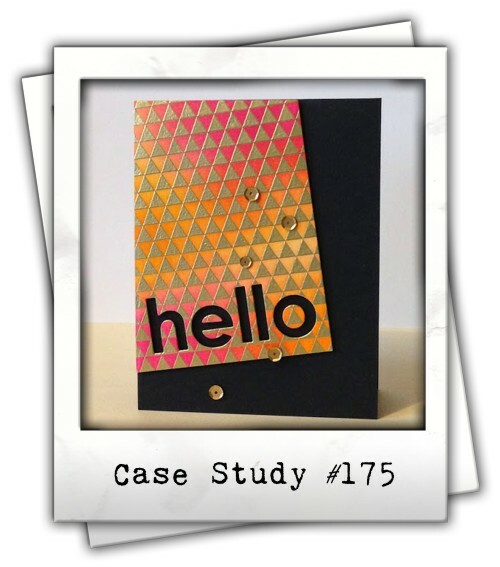 I haven't really been a fan of the angled card fronts, but I love what you did with it here! What a sweet card, perfect for dad! Love that you opted out of all the bright colors and focused on some of the other details.